Coles and the SDA have agreed on a draft new EBA to cover retail store team members. The negotiations with the Company, which took place over thirteen full days commencing July 4th, were difficult as they were based around the General Retail Industry Award, meaning that many hard won and long-standing conditions in the Coles Agreement were at risk. Given what was at stake, the SDA devoted considerable resources to ensuring we had the most effective negotiating team meeting with the Company, and to ensure that members and delegates were kept up-to-date. 500 SDA Shop Stewards/Delegates last met on Tuesday 12 September to endorse positions for the remaining outstanding matters. delivers an outcome consistent with our four key priorities. There is still some work to be done before the proposed new Agreement can be put to Coles employees for a vote. Drafting will continue to finalise wording in a fortnight. At the appropriate time there will be further meetings of SDA Shop Stewards/Delegates. The Company position is to have the new Agreement commence operation next year because of the case before the Fair Work Commission on termination of the 2011 Coles Agreement. All Coles workers will vote on whether to accept this proposed Agreement. 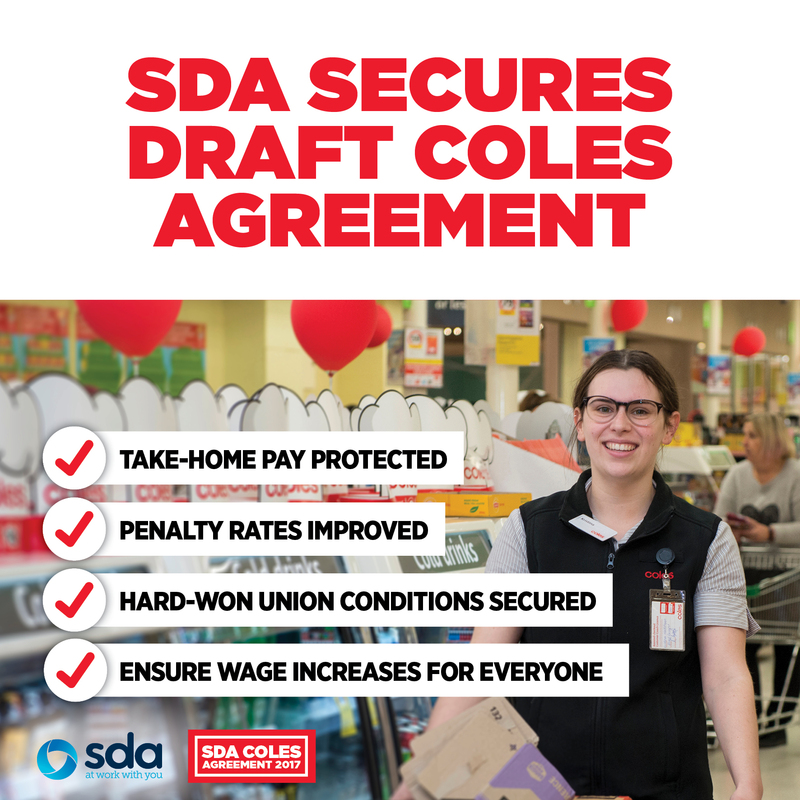 As the Agreement contains significant changes from previous Coles Agreements, once the Agreement drafting is completed the SDA will be out in stores explaining the new proposed Agreement and how any changes may affect you. You will receive all the information you need to make an informed decision about your pay and conditions. Remember, no new Agreement will be put in place unless the majority of Coles workers vote yes. You can also read more about the proposed Coles Agreement online anytime at www.sda.com.au/coles. The SDA will keep all members informed about dates for roll out and voting as it happens. If you have any questions, please contact the SDA. The SDA has worked hard to ensure that your take-home pay is protected. The Agreement ensures you will be paid more than the Award at all times and includes a top-up mechanism to protect the take-home pay of existing staff. *These figures are subject to improvement if the SDA wins current legal proceedings. These new penalty rates are based on the Retail Award. The SDA is currently appealing the recent decision to cut Retail Award penalty rates in the Fair Work Commission. If we are successful in our appeal and the decision is reversed, we have ensured that penalty rates in the new proposed Agreement will also be changed. 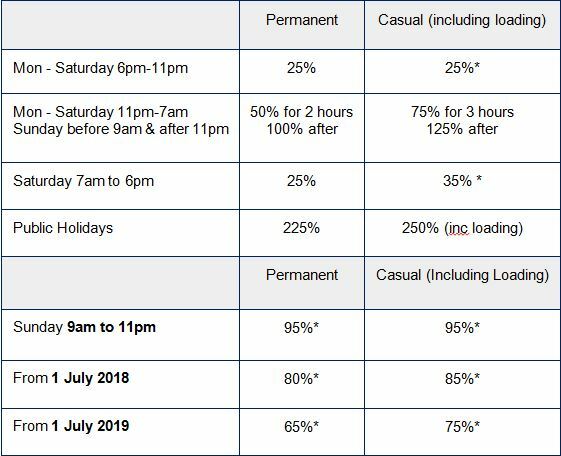 The SDA is also running a case in the Fair Work Commission to ensure casuals are paid a penalty rate for working evenings and the casual penalty rate of 10% on Saturdays is increased to 25%. If we win these cases in the Commission, they will also be changed in the new Coles Agreement. Transitioning to a new Award-based agreement means the SDA had to fight for the better conditions SDA union members have won over decades of bargaining. •	Voluntary work on Public Holidays. •	Voluntary work for Easter Sunday, Christmas Eve and New Year’s Eve subject sufficient staff being available. •	Rosters to take into account family, study and transport commitments. •	Status Quo for Roster Disputes. •	Adult rates at 20 from day one. •	15 Minute Tea Breaks. •	All current saving provisions. •	Better compassionate leave than the award. •	Existing Domestic Violence leave clause with additions. •	Long Service Leave at half pay. •	Superior Parental Leave provisions. •	REST as Default Fund. Despite fighting to retain all the conditions in the previous Coles Agreement, there will be some changes. •	Some previous casual rostering protections. •	Upfront crediting of personal leave – this will now be progressive throughout each year (as per Award/Act). •	Higher junior rates for 18 & 19 year olds. However, junior rates are higher than the award. (Protected pay rate applies for existing staff). •	Broken Hill Conditions (Savings apply). •	Western Australian and Northern Territory Allowances (Protected pay rate applies). •	Additional day of Carers Leave. There are also a range of new rights for Coles workers as part of the new agreement. •	Overtime rates now apply to work from 11pm to 7am, unless engaged as a shift worker. •	No 20% reduction in part time hours clause. •	Casual Conversion clause- made possible due to the SDA/ACTU Case at the Commission. •	2 Days Paid Domestic Violence Leave. •	Increase part time hours to 12 month average clause. •	Permanent team members to receive 2 consecutive days off each week or 3 per fortnight. •	Tea Breaks apply at 4 hours. Retention of 15 minutes inclusive of walking time. •	New Freezer Allowance of $0.43 per hour. •	New Broken Hill Allowance. A $475 payment (for full-timers – note: pro rata amount for part-time and casuals to be determined). This will be made to employees upon a positive vote, but payable no earlier than 15 January 2018 (payment would apply to staff employed as at 30 June 2017). This was important for the SDA to secure as a wage increase has not been paid since July last year. Pay increases will occur in July of each year under the new Agreement and will be based off the Annual Wage Review conducted by the Commission- where unions including the SDA fight to secure the best possible increase for workers. The SDA has fought hard to deliver the best possible outcomes for Coles workers and the framework of the proposed agreement has been endorsed by 500 SDA Delegates at Coles. Now, it’s time to have your say. No new agreement will be introduced without a vote of all Coles workers. Dates for voting will be finalised in due course and the SDA will provide more information about the voting process to all members. The SDA will roll out the proposed agreement in stores so that every Coles worker is provided information and can ask questions. If you have any questions or concerns about this please speak to your SDA Shop Steward/Delegate, Organiser or contact the SDA. The SDA will provide members with updates as this process progresses.